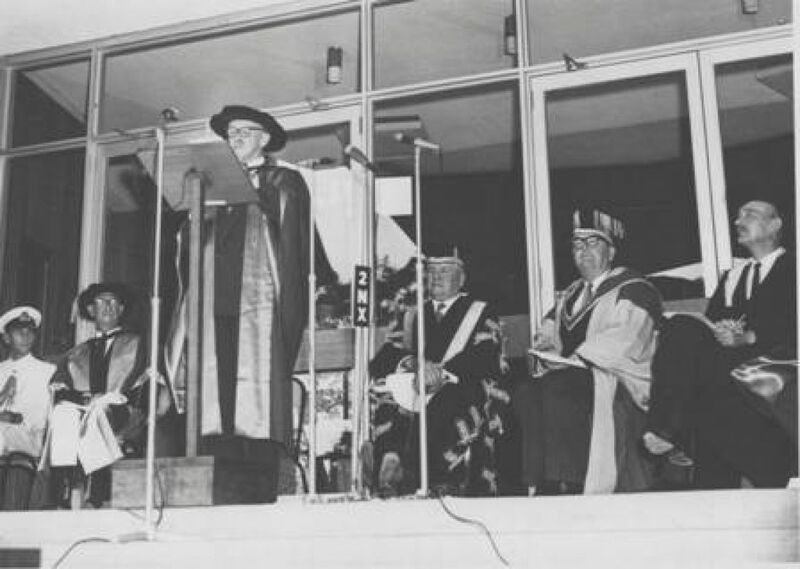 Opening of the Newcastle University College, December 1951. 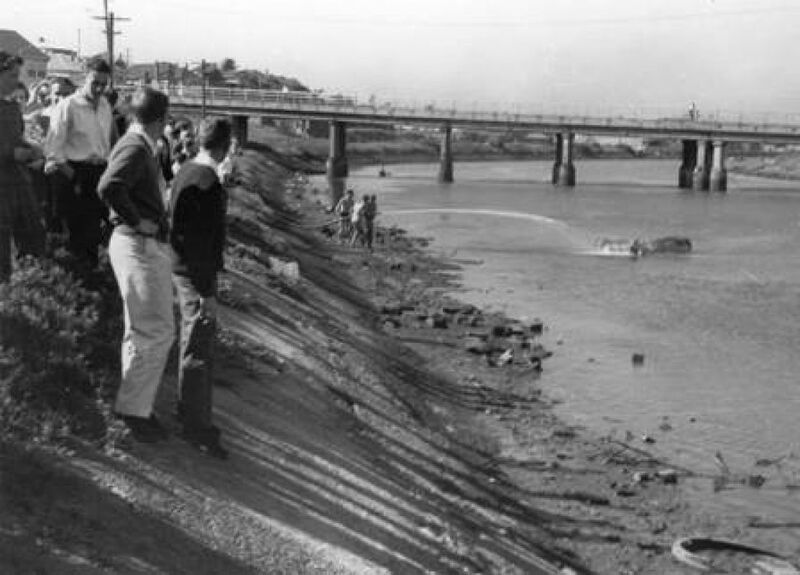 Lord Mayor’s Committee for the Establishment of an Autonomous University of Newcastle inspecting the Shortland site, circa 1962. 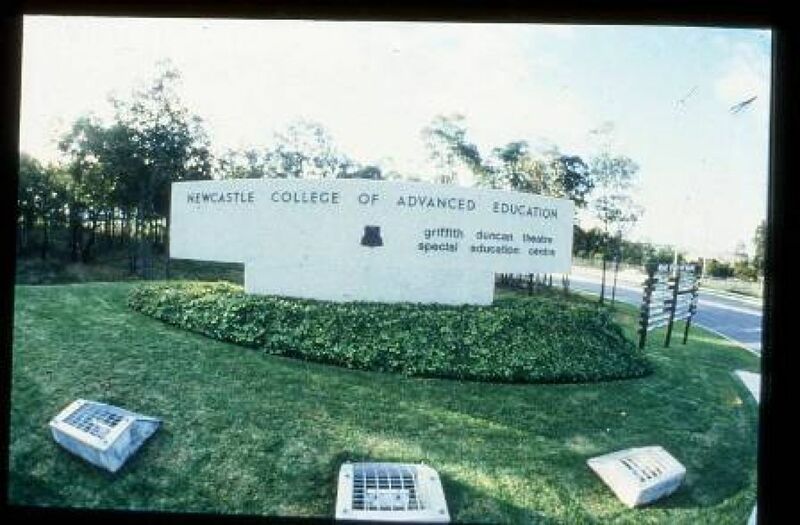 It was located at Tighes Hill—on the same site as the TAFE NSW Hunter Institute, then known as a Technical College. The staff and students of the Newcastle University college shared cramped conditions with their Technical College colleagues. 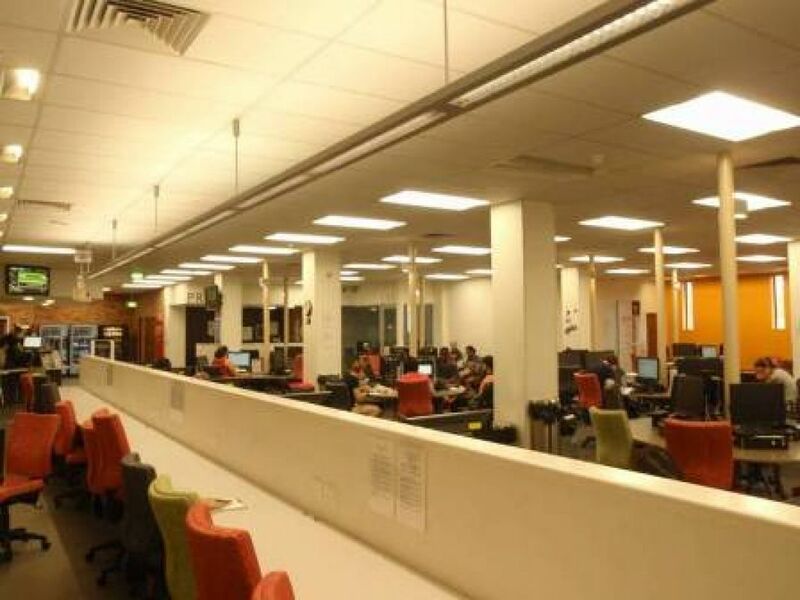 Space was at such a premium that one lecturer's office was his car; another lecturer, Dr Beryl Nashar, was accommodated with a flimsy partition in the typing pool. 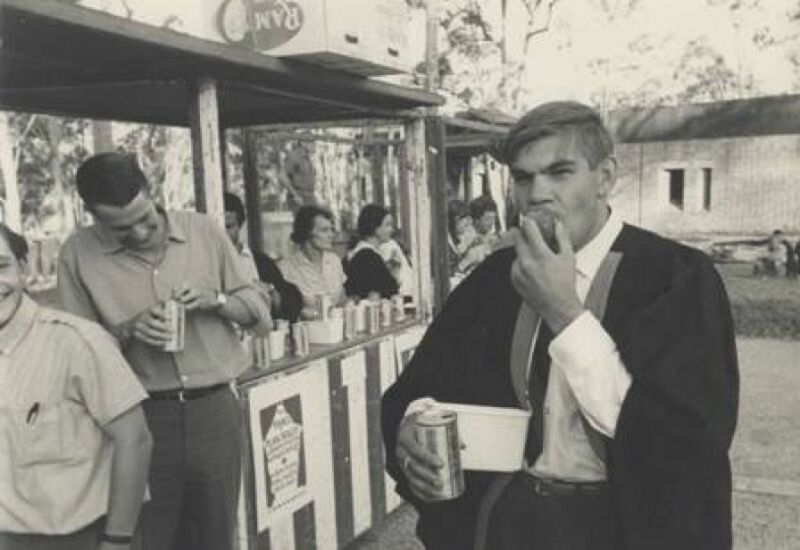 First graduation ceremony for the autonomous University of Newcastle, 1966. 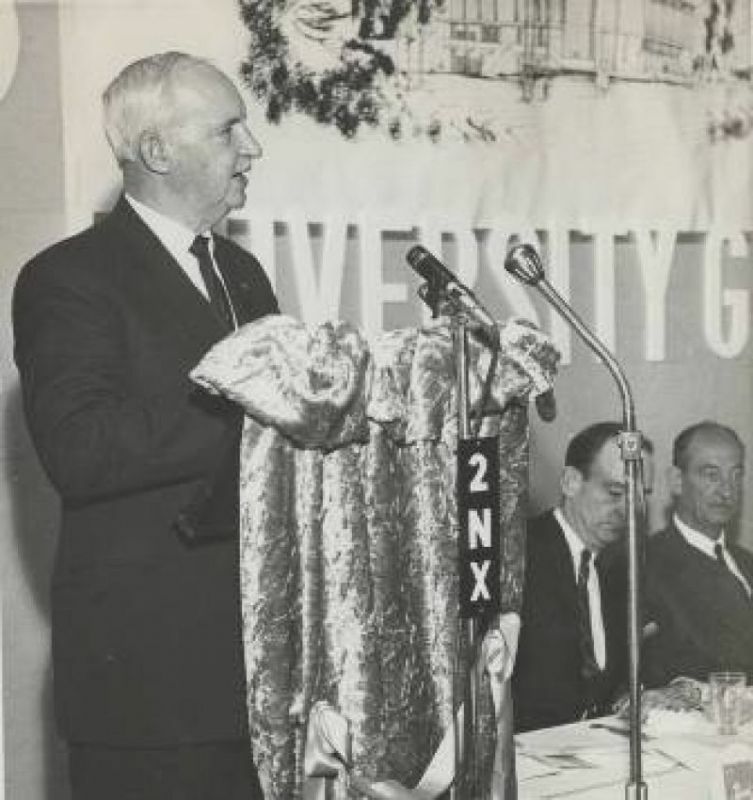 Frank Purdue at the Great Hall appeal dinner, 1966. 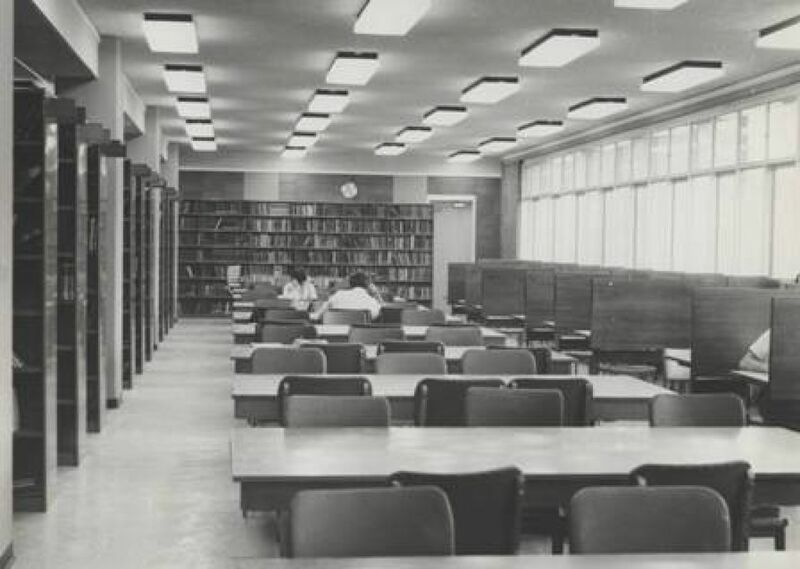 University Library, then housed in the McMullin Building, 1966. Official opening of the McMullin Building, the first building completed on campus. 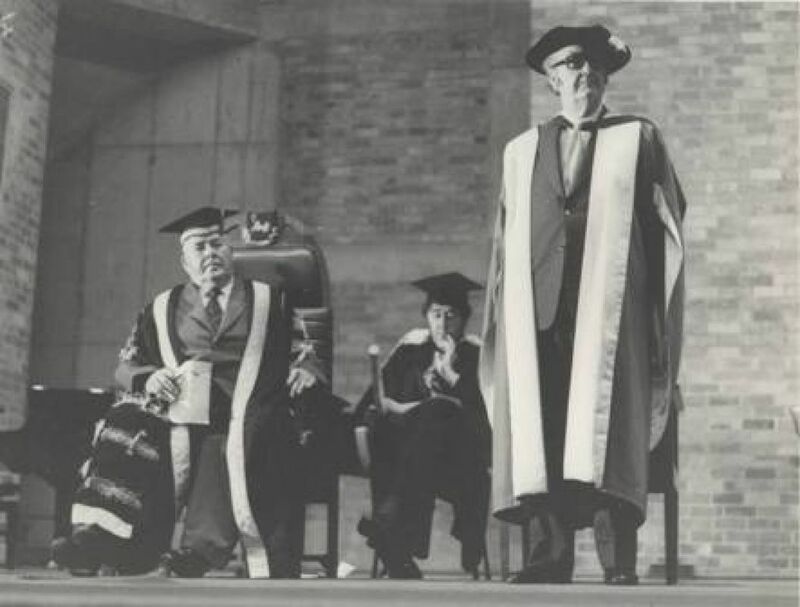 Lord Casey at the lectern, George Edwards to the left; Chancellor Sir Alister McMullin, Vice-Chancellor James Auchmuty, and Bryn Newton John to the right, 1967. 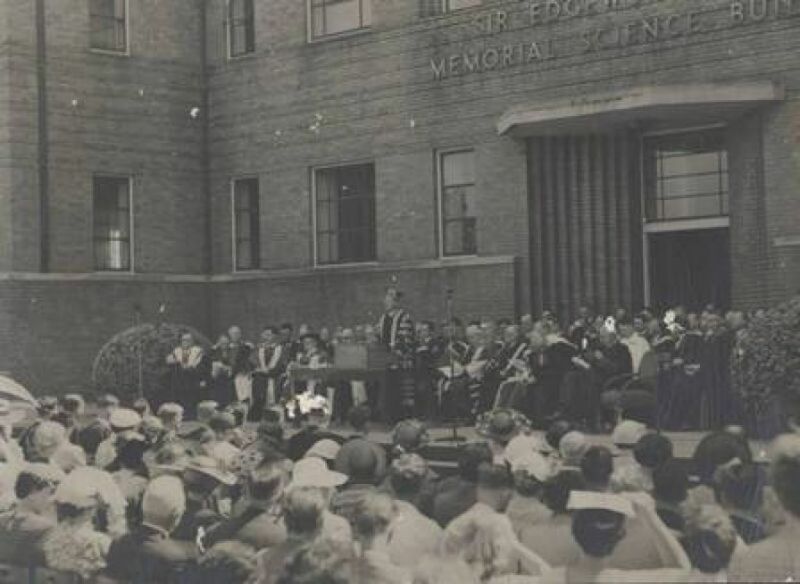 Laying of Great Hall Foundation Stone. 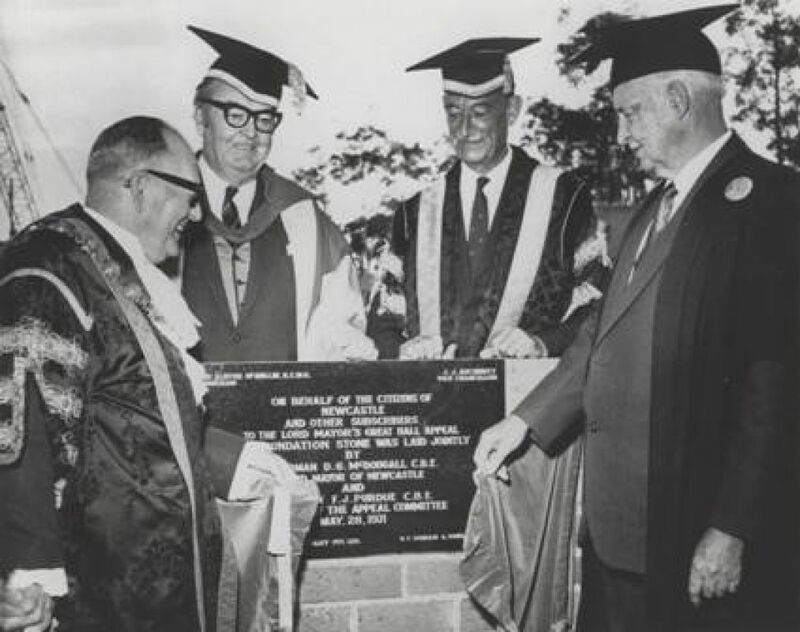 From left, D G McDougall, Vice-Chancellor James Auchmuty, George Edwards, Frank Purdue, 1971. The construction of the Great Hall demonstrated this community connection. It was funded largely by the community. 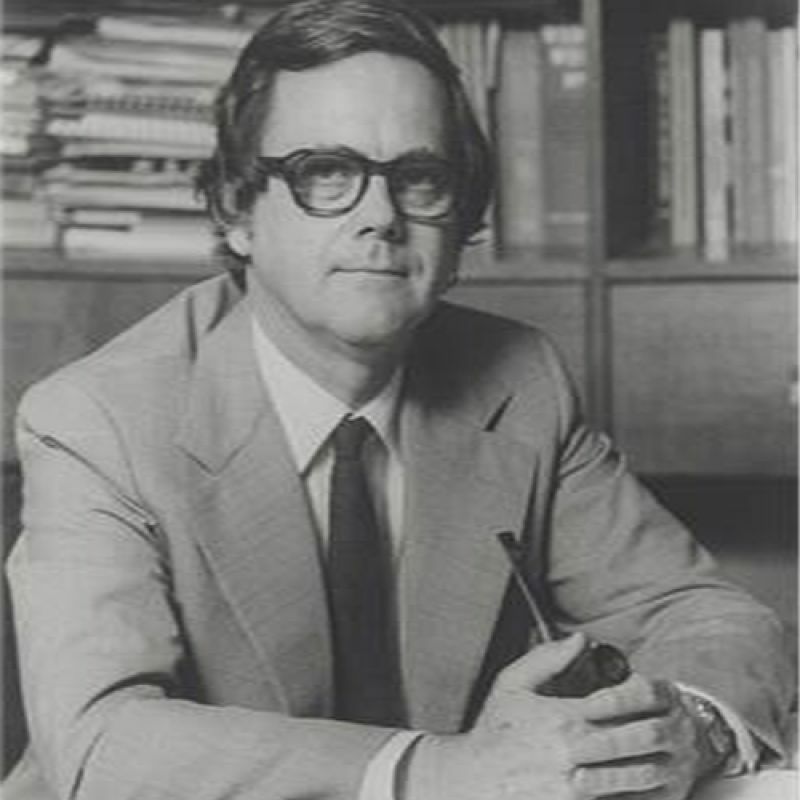 Former Newcastle Lord Mayor Frank Purdue spearheaded a fundraising campaign. Community members 'bought a brick' to build the Great Hall. 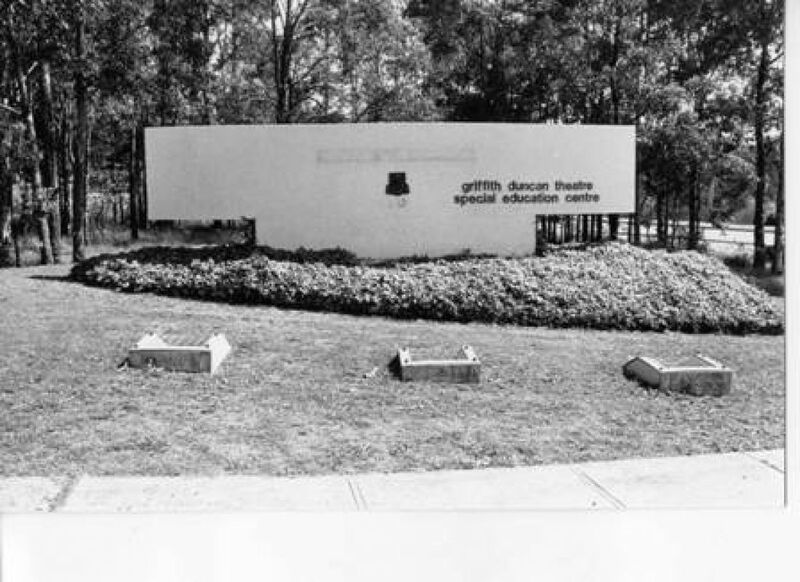 In 1971, the Foundation Stone was laid. 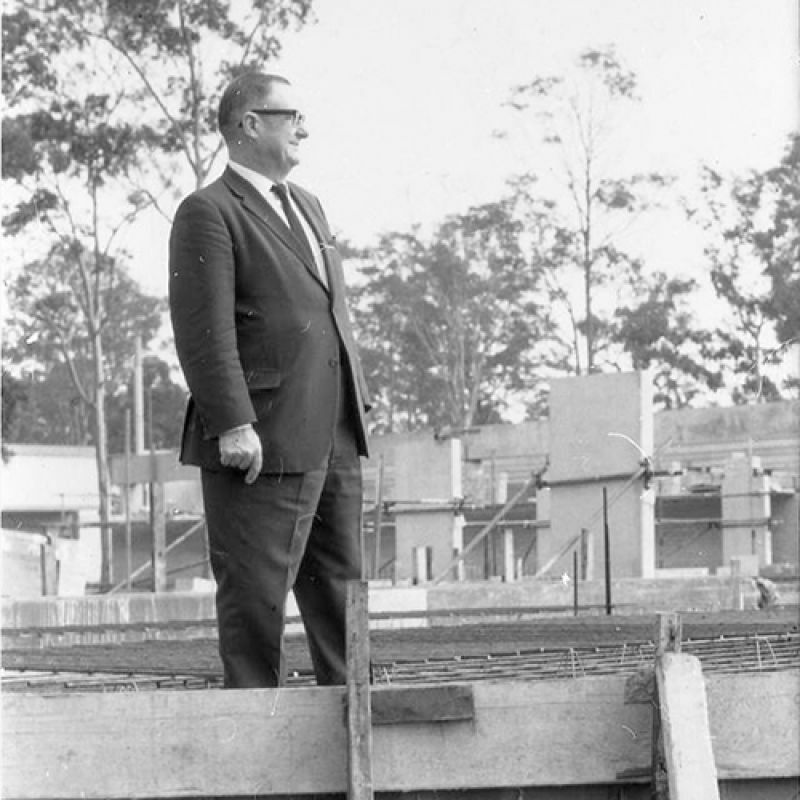 Early 1970s Principal of the Newcastle College of Advanced Education, Griffith Duncan, at the site of the Hunter building. 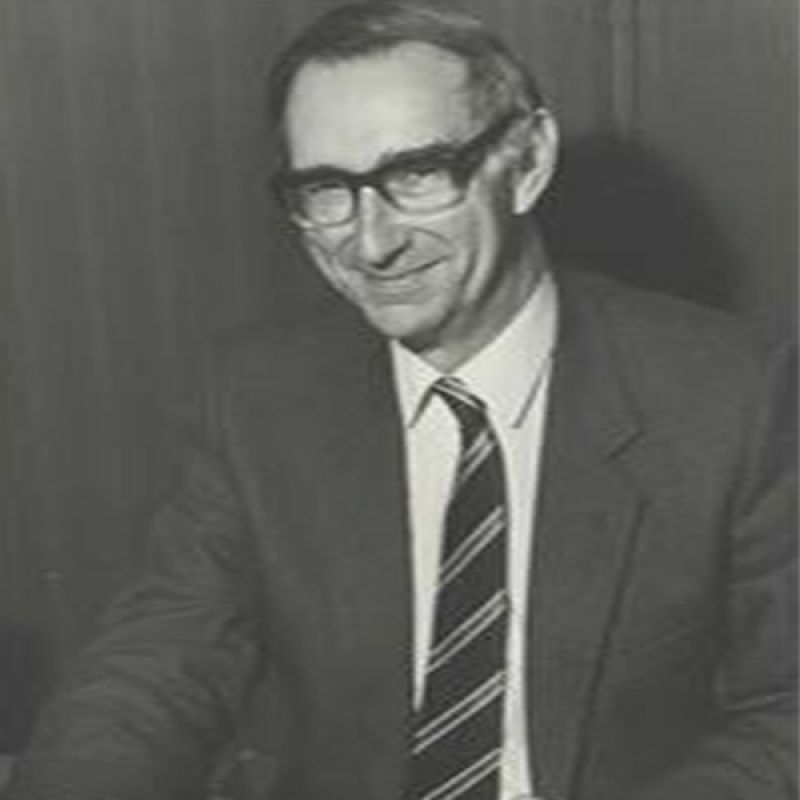 At the end of 1974, James Johnson Auchmuty, the University's Foundation Vice-Chancellor, retired. 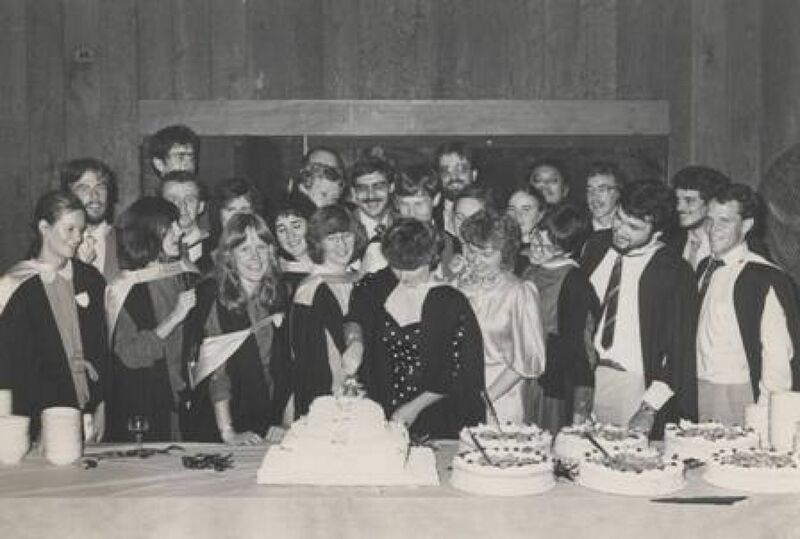 It ended a twenty year association with tertiary education in Newcastle and began a new era. He was succeeded by Don George, who inherited a much larger University and the challenge of shepherding an innovative medical program to maturity. One of Auchmuty's last acts as Vice-Chancellor was to oversee the hiring of Professor David Maddison as Foundation Dean of Medicine. 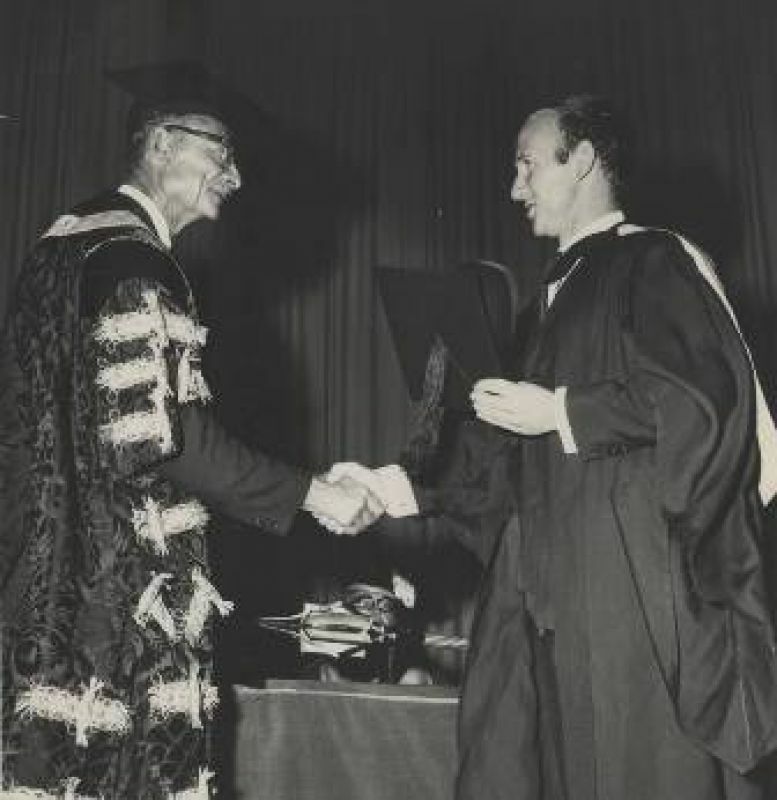 He was poached from the University of Sydney—at that time the most prestigious medical school in Australia—with the promise of a free hand to create an innovative medical program. 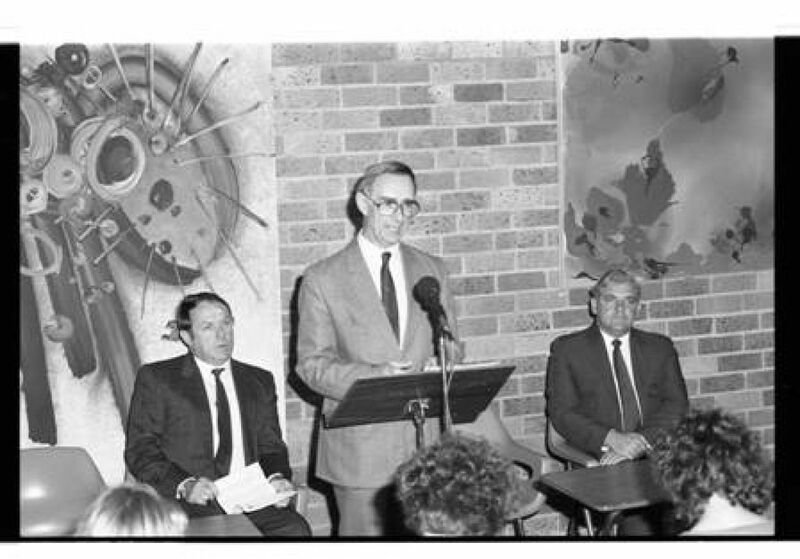 Amalgamation press conference, Vice-Chancellor Keith Morgan at the lectern, 1989. Opening of the Law School. 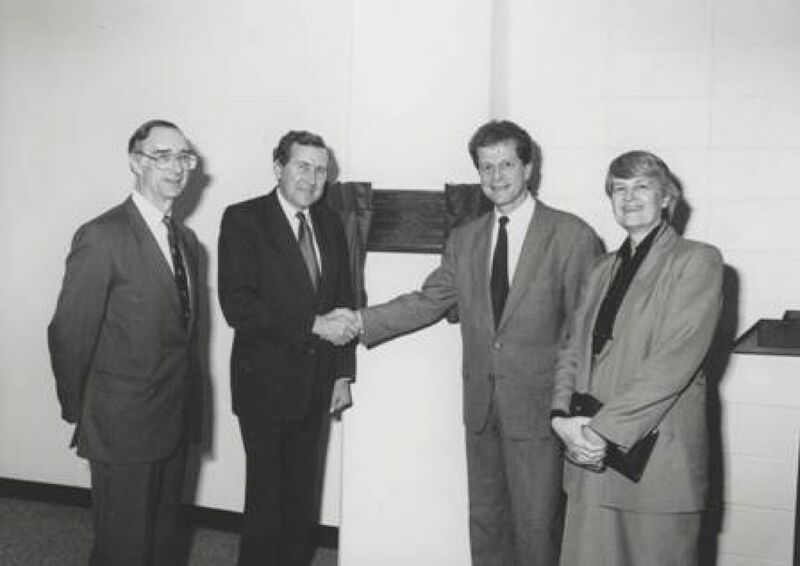 From left, Keith Morgan, Senator Michael Tate , Professor Neil Rees and Chancellor Elizabeth Evatt, 1992. 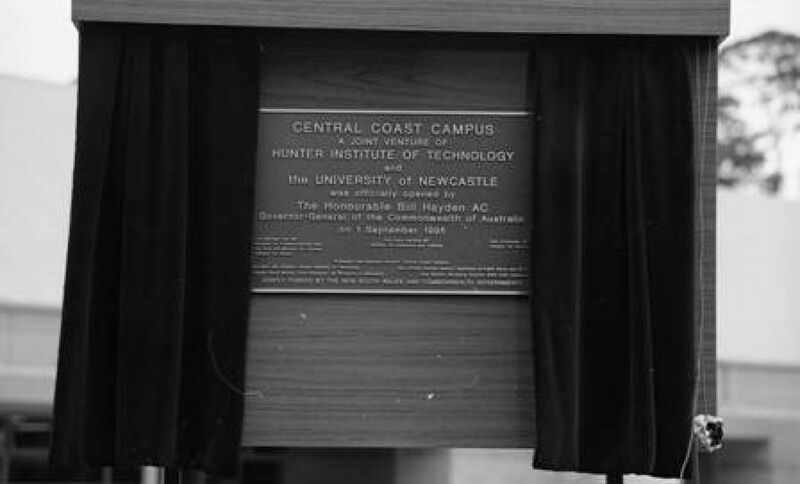 Memorial plaque for opening of the Central Coast Campus, 1995. At its beginning, the University was a satellite of another university. 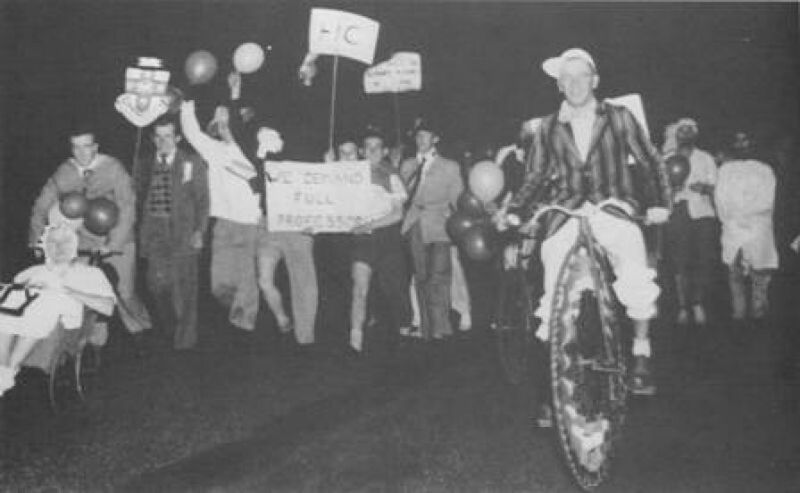 In this period the University took a decisive move to the Central Coast, expanding its regional commitment. 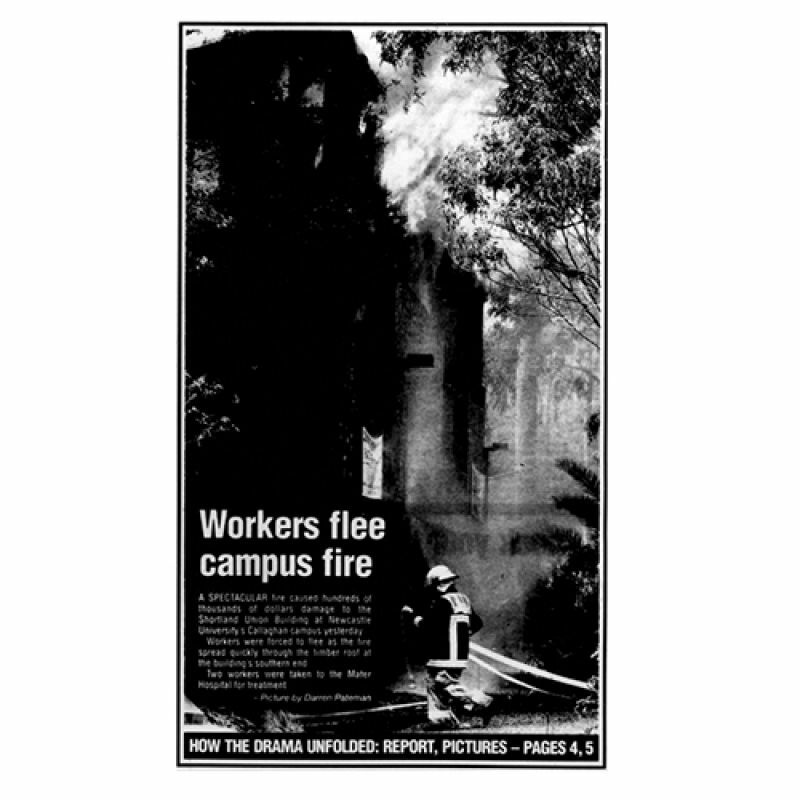 The beginnings of the Central Coast Campus were, like the University's own, rough. 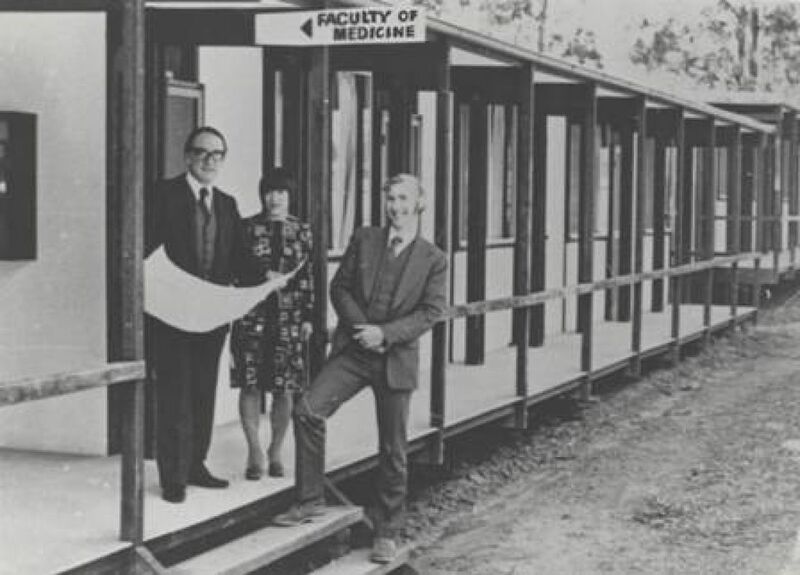 A tree planting ceremony in 1989 heralded the start of classes in a demountable called The Lodge. Opening of the Forum, 1997. This period of the University's history has seen fundamental changes to the technologies with which we teach and the nature of student experience. 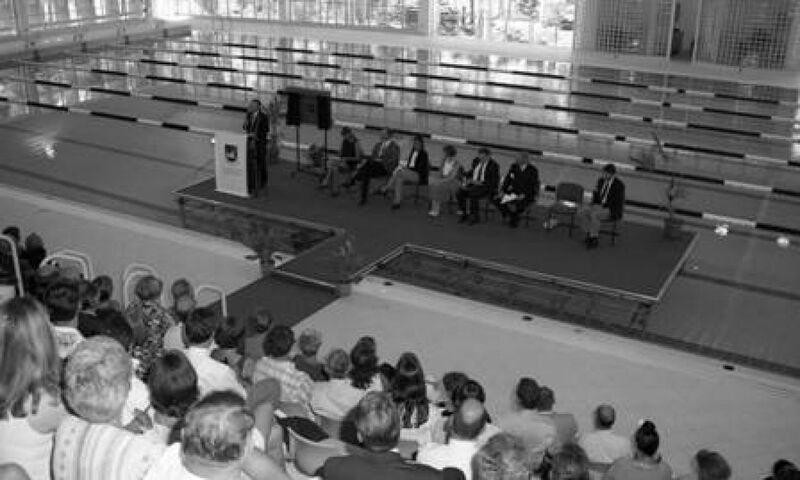 In 1997 The Forum was opened. At the time, it was the largest gymnasium in the area. In the early days of the University, team sports, particularly Rugby, were popular. The Vice-Chancellor and other senior staff members rarely missed a game, always showing up in the University colours. By the mid-nineties this had shifted; students continued to pursue fitness as part of their University experience, but now they did so on their own schedule. 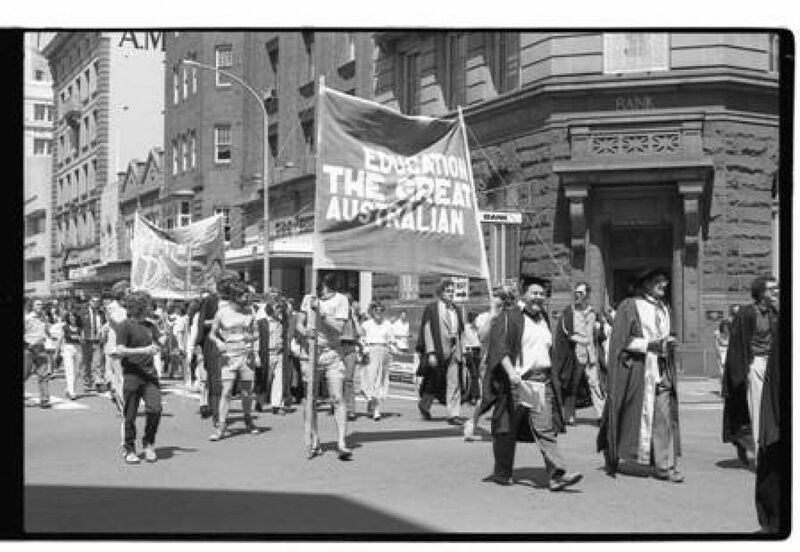 All images appear courtesy of Cultural Collections at the University of Newcastle. You can browse the entire collection here: http://www.flickr.com/photos/uon/. The collection has been patiently accumulated through the work of many dedicated volunteers.